Although still flying under the radar of most small cap investors, little-known vanadium is 2018’s best performing energy metal to date. The price of the metal used in steel alloys and rechargeable batteries is up more than 50% since January 1, and has more than doubled in price since mid-2015. While it’s clear that some early money has already flowed into vanadium, there’s still plenty of upside ahead as the super metal is still to gain the notoriety of the big-name new energy metals of lithium and cobalt. In fact, we could be on the edge of a structural change in the vanadium market due to its use in energy storage, more precisely in vanadium redox flow batteries (VRFB), which many believe could be a superior way of storing grid energy than lithium-ion. Demand is also likely to get a boost from a forecast lift in vanadium in the manufacture of steel alloys. 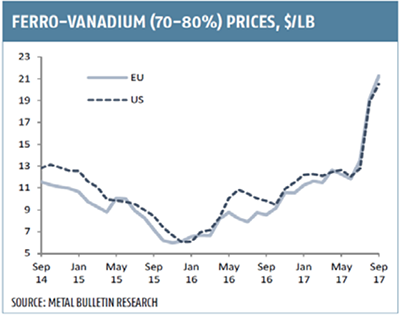 Global vanadium inventories will be limited in coming years, and in combination with growing demand for the metal’s use in steel alloys and VRFBs we should see vanadium prices rise further, extending what is now an eight-year high. There are further catalysts for this current dynamic. The most pressing is the new rebar standards covering the tensile strength of rebar products introduced by China. The new standards increase the amount of vanadium required in rebar products. The move looks set to significantly boost vanadium demand in the country. The China Iron & Steel Research Institute said earlier this month that the revised requirements for the standard tensile strength of rebar products in China could increase vanadium consumption by 30 percent, or 10,000 tonnes per year. That is a significant number that would likely benefit vanadium producers such as today’s ASX junior explorer, which is looking in future to corner the vanadium market. Of course, today’s junior stock remains a speculative play at this stage and investors should seek professional financial advice if considering this stock for their portfolio. The second catalyst is a ban on vanadium slag imports. China’s scrap import ban at the end of 2017 was designed to cut approximately 4,500-5,500 tonnes from the country’s vanadium pentoxide (V2O5) production per year. There are few vanadium exploring companies on the ASX, especially those exploring for vanadium as their primary target and even more importantly — operating in a mining friendly first world country such as today’s company. The good news for investors who haven’t yet recognised the potential in vanadium is that the metals promising fundamentals are forecast to improve further. And for small cap investors, there are a number of vanadium plays out there with big potential. Today’s company is one of the few small cap options available on the ASX for those looking an early stage future vanadium producer. 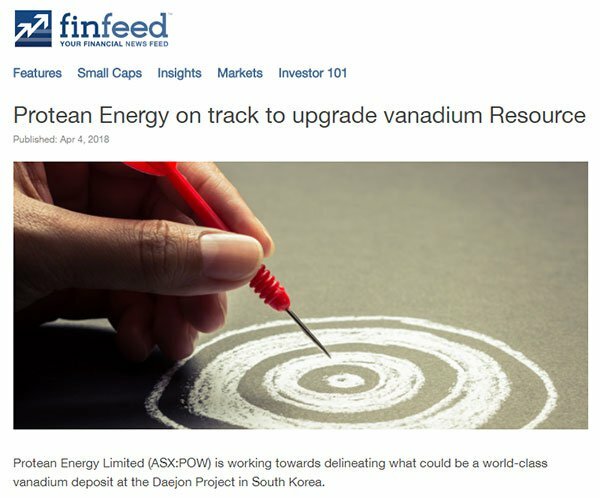 The company is busy developing a multi-mineral project in South Korea and its flagship project already hosts a defined vanadium Mineral Resource as well as a uranium Resource. Its location in South Korea is notable and gives it a leg up on a number of its peers who don’t enjoy the benefits of operating in a developed economy that offers the benefit of having all the necessary infrastructure (cheap nuclear power, rail, road, access to major populations centres), plus a stable political system that is supportive of overseas mining investment. Not to mention the end user being situated in-country. Also, the sedimentary style mineralisation is very similar to that found in China from which low impurity vanadium is extracted. Another benefit of its operations being in South Korea, is that the country has an exceptional world-class technology industry and is home to a number of vanadium end users that are developing rechargeable batteries. These are important advantages for this company, so let’s explore them further. Currently, the lion’s share of vanadium is produced in China, where shale-sedimentary style vanadium deposits tend to have lower impurities. It’s this low impurity vanadium that is required to create VRFBs. Interestingly, vanadium is rarely mined on its own as it often occurs in vanadium-bearing magnetite iron ore. For many producers vanadium has been little more than a by-product as they mine bauxite, iron ore, gold, copper, oil or uranium. Along with China, Russia and Venezuela are also large contributors to global supply. However, these countries come with political issues and substandard infrastructure. South Korea could offer a significant point of difference to the market. POW is developing the multi‐mineral Daejon Project through its 50% holding in Stonehenge Korea Limited (SHK). SHK owns 100% of the rights to three projects in South Korea — the flagship Daejon Project, plus the Gwesan Project and the Miwon Project. Through this holding, POW also owns a part share of battery factory in South Korea that could see it have an end-to-end production to processing pathway. The Daejon Project was initially seen as a potential source of uranium for Korea’s nuclear power sector. However, upon further investigation POW concluded that the project’s economic success would be enhanced by maximising the amount of vanadium recovered from mined ore. Strong vanadium prices, in combination with a depressed uranium price, have supported this revised strategy. The vanadium price has risen significantly since 2015 and has continued to make especially strong headway so far in 2018 — rising more than 50% since the start of the year. Of course commodity prices do fluctuate and investors should take a cautious approach to their investment decisions and not base these decisions on commodity prices alone. Vanadium is essential in the development of high-strength steels and over 90% of vanadium consumption comes from the manufacture of steel alloys. It enhances the durability of steel whilst reducing weight and increasing tensile strength. It also gives better resistance to corrosion from salt water, hydrochloric and sulphuric acids. The increased intensity of vanadium use in steel is driving near term demand growth. In 2016 global vanadium production was 76,000t with demand expected to increase to 131,000t/pa by 2025. And that figure doesn’t even include the significant growth anticipated in the energy storage sector. Add to that the fact that China is moving towards a minimum ‘rebar grade’ for reinforced steel used in construction. If Rebar Grade 3 standard is enforced it could add 40,000t per annum to global demand. As for the emergent energy storage sector, it currently consumes just 2% of vanadium produced — although this is higher grade and higher value vanadium. However, while the market for VRFBs is still in an early stage, the benefits that these batteries deliver for large scale energy storage are noteworthy and go towards explaining the upbeat estimates. VRFB’s have extremely large capacities that make them well suited to use in large power storage applications. They are particularly useful in helping to average out the production of highly variable generation sources such as wind or solar power, helping generators cope with large surges in demand, or levelling out supply/demand in regions in transmission constrained region. Another benefit of VRFBs is their long life and excellent performance. These batteries have a nearly unlimited number of charging cycles and come with a 20-plus year lifetime. They offer the best storage solution on a life cycle basis, and have 100% depth of discharge. The batteries are safe and sustainable, being non-toxic, having non-flammable electrolyte chemistry, and 100% of the vanadium can be re-used once the battery is removed. Other benefits of the technology are having a quick recharge, being easily scalable as power rating (MW) and energy capacity (MWh) are independent, and are proven to operate in high ambient temperatures. The benefits are so attractive that some analysts are predicting that VRFBs could account for 15-25% of the global energy storage market, with demand growing by 33% each year. That would be a rise in the current US$230 million market to US$946 million by 2023. POW previously explored the project area for both uranium and vanadium with this work culminating in the definition of both uranium and vanadium Mineral Resources. In 2012 and 2013 the Company undertook a significant body of work to understand the metallurgy and processing options for the deposit. The Daejon Project area includes an approximate strike length of 8.3 kilometres of variably mineralised shale/slate beds hosting the known vanadium and uranium mineralisation. In the 1970s and early 1980s the Korean government focused their exploration efforts on uranium mineralisation and completed a total of 36,000m of diamond drilling, however the drill core was not systematically assayed for vanadium. In 2013 POW completed a five hole diamond drilling program, targeting a small area of the known 8.3 kilometre mineralised strike length hoping to improve the confidence levels of the 2011 uranium Resource and support delineation of a maiden JORC (2004) vanadium Resource. 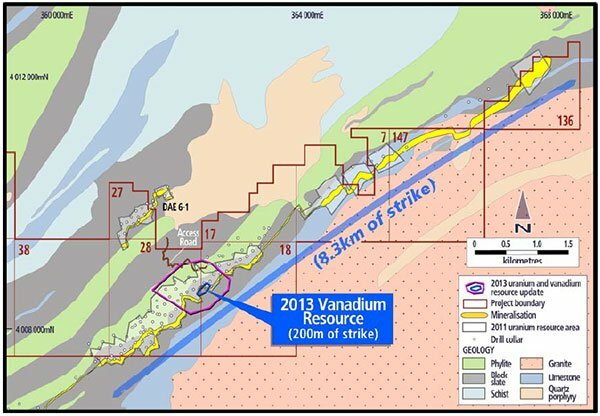 These two aims were achieved by the drill program and a maiden vanadium Resource estimate was established, covering just 200m or 2.4% of the 8.3km known mineralised host rock strike length. 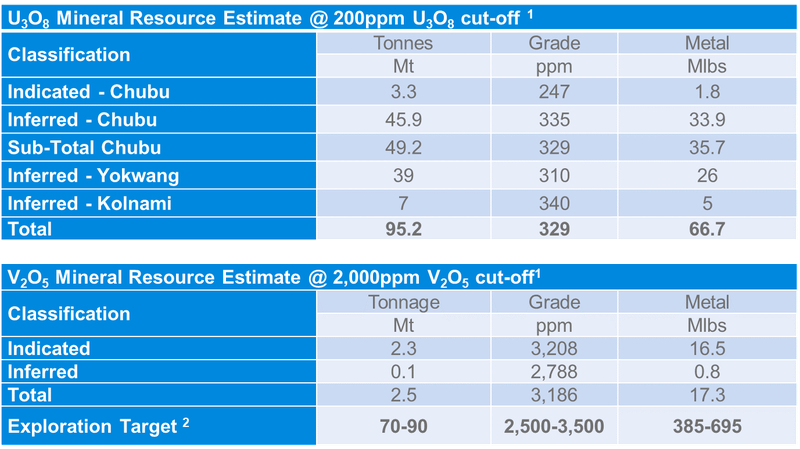 The project contains an existing vanadium Resource of 17.3Mlbs (largely indicated) grading 3,186ppm V2O5 at a cut‐off of 2,000ppm V2O5. 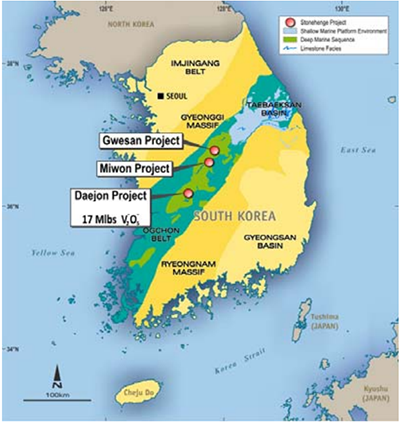 POW has identified potential to expand this existing Mineral Resource at Daejon. On January 30, POW began the pXRF program to assay core for the presence of vanadium. 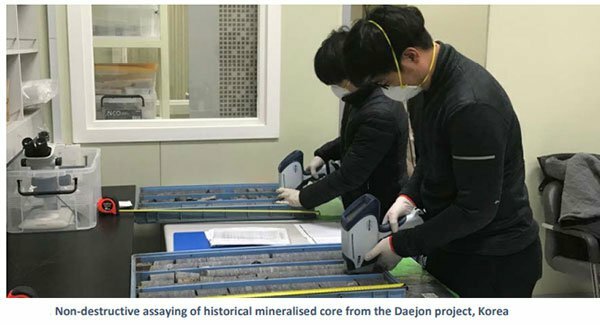 Then last week POW announced that it has completed 70% of its Stage 1 pXRF testwork at the Daejon Project. It also confirmed that technical work targeting a Resource over 8.3 kilometre strike is on target for completion during the second quarter and that it has nearly completed updated geological modelling of the vanadium ore zone. 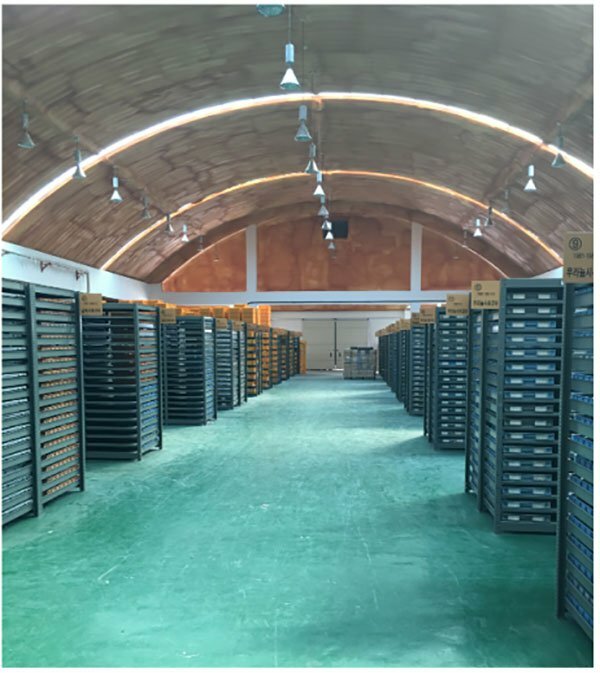 POW is currently undertaking non-destructive testing mineralised sections of 36,000m of historical core that is stored at the Korean Institute of Geoscience and Minerals (KIGAM). To date it has completed 9377 pXRF readings of the total 28,000 planned. The KIGAM core analysis work program consists of data collected from the historical core in two stages. Stage 1 involves testing 42 high priority holes totalling 2344m of mineralised core. So far, 70% of the program is complete with 1620m of mineralised core analysed. Once Stage 1 is complete POW can commence an interim Resource estimation of vanadium and uranium mineralisation over a segment of the Chubu prospect. The work is expected to be completed sometime during the second quarter of the year with an interim Resource estimate expected six weeks after test work is completed. Completion of Stage 2 will enable POW to calculate an updated JORC-2012 compliant vanadium and uranium Resource over the entire 8300m of estimated mineralisation strike length. There are a few ASX vanadium juniors that have projects in Australia. While operating in Australia delivers many similar benefits that POW enjoys in Korea, as they are both developed first world countries, Australian producers can be weighed down by high capital expenditures. This is especially true in more remote regions in WA. 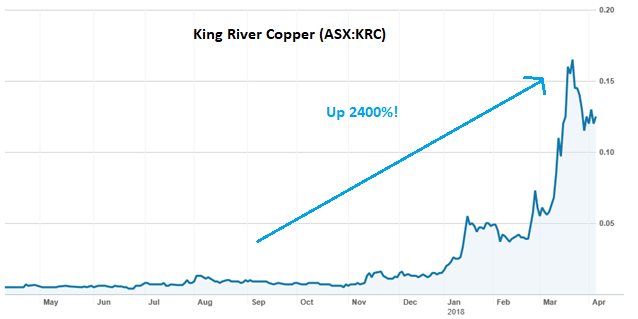 It is here that both Australian Vanadium (ASX:AVL) and King River Copper (ASX:KRC) operate. Yet these ASX juniors have already benefitted from early vanadium interest...AVL is up 188% over the past year, while KRC is up a massive 2400%. Of course, while there’s no guarantee that POW will replicate this (short term) success, so investors should seek professional financial advice if considering this stock for their portfolio. There is plenty to suggest that POW could prove to be an excellent early entry point into the market of the new energy metal vanadium. Sydney-based private investment bank, and junior resource market specialist, Far East Capital also suggest that when it comes to vanadium “maybe the best way to make money in the short term is to jump onto new entrants to the sector early”. We’d add to that it’s wise to select a company, such as POW, that operates in a stable and supportive mining jurisdiction ... and one that has an existing confirmed vanadium Mineral Resource. Super metal vanadium is in the throes of a market explosion due to a combination of heightened demand from the steel industry and in light of its recent emergence as a battery ingredient. One fact no to be missed is that POW is operating in the first world country of South Korea. Not only does Korea have all the required supporting infrastructure such as developed roads, ports, power sources.... It is also where battery manufacturers are located. POW offers exceptional upside potential for still early investors to the ASX’s small cap vanadium space. And with POW’s exploration on track and progressing as planned, there’s sure to be plenty on newsflow coming to gain the markets attention. Notable is an interim Resource is expected by mid-May.